From Ian Woodward’s hit film musical I’ll Walk with God was born Sacred! Music from the Heart. It distils into one compilation some of the best-loved inspirational songs from the musical, taking in “Ave Maria”, “Because God Made Thee Mine”, “You’ll Never Walk Alone”, “The Lord’s Prayer” and the film’s title-song “I’ll Walk with God”. The TRAILER includes tantalising excerpts from all of them. I’ll Walk with God is an emotional musical drama about a fictitious former opera star from America for whom Tosca and My Fair Lady are not sufficient in themselves to feed the inherent sense of spirituality that drives him on. His father’s homeland, England, has taken him and his family to Coventry in the West Midlands…and to the priesthood. The Rev Jim Watson (played by NORMAN BOWMAN) will always sing. This will never change. He can’t remember a time when he didn’t or indeed couldn’t express himself through the power of song. It is what he does best and is as natural to him as breathing. In and around his parish he is known as “The Singing Vicar”: he sings at charity events, church fetes and at am-dram concerts. Along the way, after meeting university lecturer Emma Crawford (VIRGINIA BYRON) at the local allotment that is his distraction and her therapy, things will never be as they once were for either of them or for Jim’s actress daughter, Holly (CLAIRE HEVERIN). I’ll Walk with God has been screened worldwide. Among its 30 awards have been those for Best International Musical Drama, Best Foreign Musical, Best Short Film, Best Director, Best Actor, Best Actress, Best Supporting Actress and Best Choir for The Encore Films Choir. 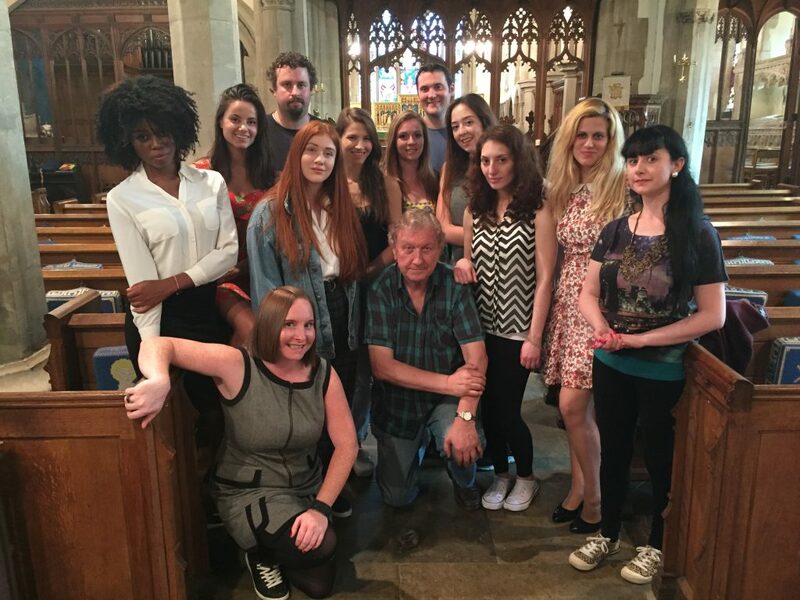 Director-Screenwriter Ian Woodward – front, centre – with members of The Encore Films Choir during rehearsals. Front left: Natalie Anne Owen (Organist & Choir Vocal Coach). Back row: Paul Richardson (Sound & Boom Operator) and Jamie Montgomery (Gaffer). Below: Choir’s high spirits between takes.